Today (Tuesday): Humid, gusty, showers/downpour. Highs around 70. Overnight Tuesday Night: Locally damaging wind gusts, showers to rain & thunder. Lows in the 60s. Wednesday: Downpours, thunder. Windy Cape Cod. Highs in the 60s. It didn't take Mother Nature long to switch from mellow to mildly mean. While we did see this event coming more than a week ago, we just recently came to realize that this storm system is catapulting us into a more active autumn pattern. That's the subject of another blog all together. Our attention is focused on the upcoming storm. Rain and wind are heading in, but they're not entirely together. Typically, the strongest winds coincide with the most intense rain. This time around, however, it appears that there's a distinct disconnect between the two: wind steadily ramps up Tuesday, then the heaviest rain follows Wednesday. 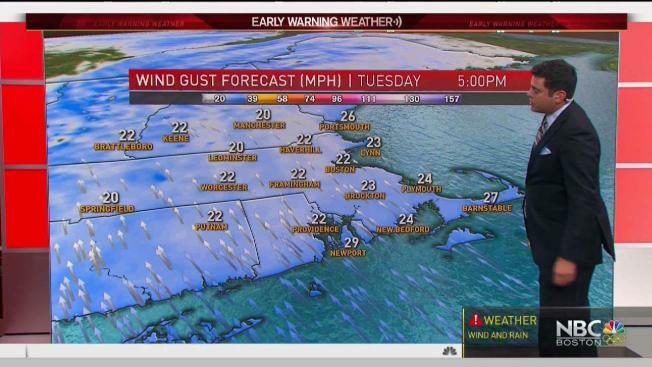 Winds slowly increase through the day Tuesday with peak gusts by Tuesday evening/night near 40mph (some close to 50 on the Islands and in elevated terrain in the Worcester Hills). Occasional rain or quick-hitting downpours will zip by from time to time. Wind and fast-moving rain will continue Tuesday night. Potentially flooding rain will accompany the downpours and thunder on Wednesday through mid/late morning as the wind eases. Commute on Wednesday morning is most affected by the rain, with marked improvement by Wednesday evening. Cooler air to follow, as we watch a nearly identical storm late Sunday and Monday. It's not a blockbuster, but with a lot of wind and rain - coupled with the recent spell of quiet, warm weather, we thought it would be wise to roll out the headlines.